Villa Atlantis is located in Pregassona and is surrounded by a 1551 sq.m. (of which 274 sq.m. wood) well-kept partially flat garden, in a very sunny and quiet residential area facing south east, with unrestricted view of the lake, the surrounding mountains and the city. 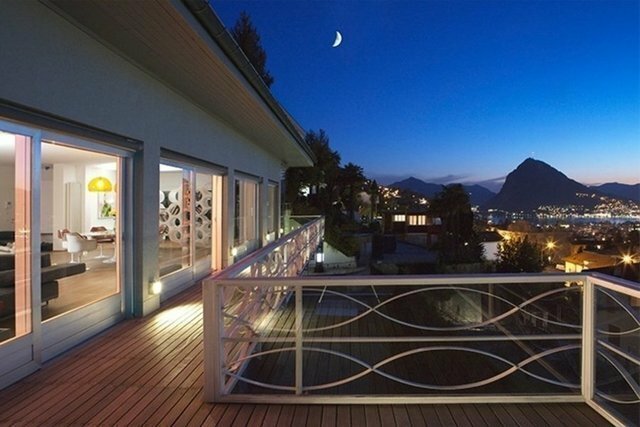 The property is only a few minutes from Lugano center. The villa was built in the 1969 and was carefully renovated in 2004/2006. It is in perfect condition and features a living area of 773 sq. m. on three floors dividen into big and bright rooms. Moreover it offers a panoramic terrace, a flat garden, a pool, an elevator, three covered parking places and several outdoor parking places. The property is divided into two living units, but can easily be converted into one. The house comprises: ground floor: studio with room and bathroom, technical room 1st floor: entrance, guest toilet, spacious living room with dining area, kitchen, 2 bedrooms, 2 bathrooms, master bedroom with 2 en-suite bathrooms and wardrobe; 2nd floor: entrance, guest toilet, spacious living room with fireplace and dining area, kitchen, 2 bedrooms both with en-suite bathrooms, spacious wardrobe; mezzanine: studio Villa Atlantis is the ideal home for a family seeking privacy in a peaceful location within walking distance from the city centre.